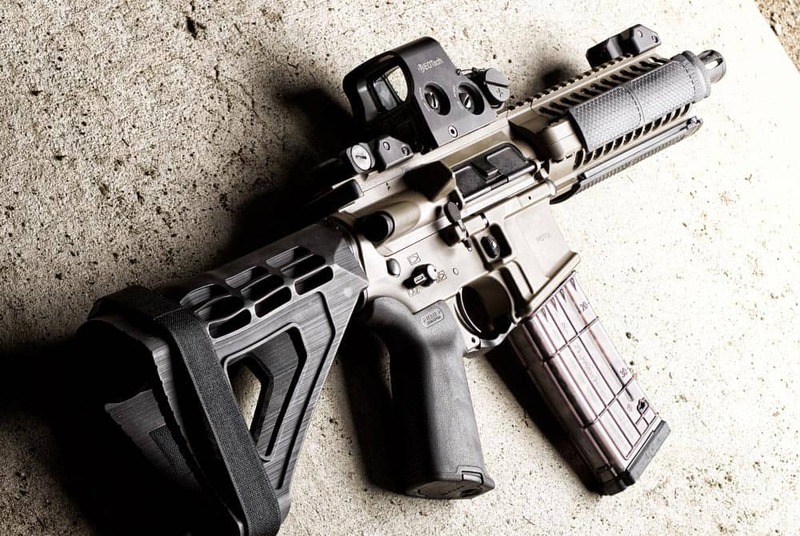 In recent years, the AR pistol has become a popular short-barrel alternative to the standard longer-barrel AR-15 rifle. By definition, the gun is functionally equivalent to that of a full-size AR-15 but sports a short barrel, typically 7 to 10 inches, and a pistol buffer tube that does not allow a traditional stock to be attached. This configuration, specifically without the stock, avoids the AR pistol being classified as a short barreled rifle which saves you from extra regulations and costs associated with owning a genuine AR-15 fitted with a barrel less than 16 inches. The benefit of the AR pistol packs the power of a .223/5.56 round into something easier to carry and handle than a full sized rifle. When you attach a quality optic sight to this configuration, you get a powerful package with rifle-like accuracy, friendlier dimensions, and better maneuverability. Here is a guide to the best optic for your AR pistol. Optic sights and scopes are not the same things and it’s important to understand some key differences when shopping for an AR pistol optic. Low Magnification – Scopes are designed for zooming in on a target and providing greater shooting distance at longer range. A quality optic, on the other hand, is more about target acquisition and the ability to hold the target in view. When changing target distances, scopes require some adjustment to the zoom level. This is not the case with an optic sight since it is designed for a different purpose. Short Range Engagement – Optic sights are designed for short-range engagement of a target. The goal is to capture the target quickly in your sight and be able to follow movement without the limitations of traditional sights or the necessary adjustments to a scope. The AR pistol itself is intended for short range shooting which is why it pairs well with a smaller optic sight. Moving Targets – Try following a fast moving target with a scope and you’ll find the limitations of keeping a bead on the target at a high magnification level. Sudden movements by the target can take it out of view making it hard to track. An optic sight, equipped with an illuminated dot or reticle, makes it far easier to track sudden movements at close to medium ranges since the field of view is much wider. Optic sights differ in their features between brands and models. Just like shopping for a scope, you’ll want to look at some basics like durability, warranty, and weatherproofing to get a baseline reading on where a particular product stands in the lineup. Here are some great options when you’re searching for the best AR pistol optic. This model from Primary Arms offers crisp image quality and a set of basic features at a good price point. While it does not have any advanced features beyond an illuminated red dot and windage/elevation adjustment knobs, it makes up for the shortcomings in overall value. This is a great example of a minimal red dot sight, though it is built for durability including a design that is geared toward heavy recoil firearms. Primary Arms also backs it up with a lifetime warranty which is nice to see at any price point. The red dot illumination claims 50,000 hours of battery life which makes it reliable over the long haul and means you won’t be worrying about whether your optic battery needs to be changed any time soon. It is also compatible with night vision and is designed for low-light environments with multicoated lenses and an ultra-low profile light emitter to ensure a clean sight with minimal lens tint. It also includes a removable Picatinny base for easy mounting on most AR pistols. Sig is a name synonymous with quality firearms and firearm accessories, the Romeo5 line of their compact red dot sights is no exception. Designed to be powerful with a built-in Picatinny rail mount, the Romeo5 was practically made with the AR pistol in mind. This optic is IPX-7 rated for complete water submersion up to 33 feet so it’s built to withstand even the harshest environments mother nature can throw at it. Also featuring 50,000+ hours of battery time, and an exclusive Sig feature that turns off the illumination when no movement is detected, this scope spares little in terms of ingenuity or high-end features. The 2 MOA red dot offers 10 illumination settings which include 8 for daylight and 2 for night vision. The dot is visible in all lighting conditions. Users praise this sight for continued accuracy over time, even after thousands of rounds which can sometimes wreak havoc on lesser quality optics. The motion detection battery-saving feature also gets high marks from users. Related Reading: Sig Romeo 5 Review. Bushnell has been making optics in all forms for a long time and they have built a reputation for quality. The TRS-25 offers the Bushnell name at a very affordable price point. You won’t find any high-end features on this sight, but it’s built to last, 100% weatherproof, and makes a great addition to any AR pistol. This optic features what Bushnell calls the “Amber-Bright” lens coating which helps with target distinction, such as seeing different shades of brown in low-light environments. This is largely intended to speed up the time of target acquisition making this a good hunting option. Users report that this feature helps when hunting in the woods during autumn when shades of colors can blend together. The eye relief is unlimited, meaning it’s easy to use with either eye and allows you to be more aware of your surroundings since your head can be much further back from the eyepiece. As far as red dot sights go, you’ll be hard-pressed to find one with this quality at this price point. Manufacturers usually sacrifice build quality to lower the cost, but in this package, Bushnell has produced an affordable option that holds up over time. Sightmark was founded in 2007 with the goal of serving the modern shooting sports market with state-of-the-art scopes and optic sights. Today, the Sightmark brand is known for holding true to that mission and the SM26008 Ultra Shot Plus is a great example of a fine red dot sight. This model varies from other optic products on the list in that it has a smaller form factor more closely resembling a traditional iron sight. However, it features an illuminated red or green reticle with several style options to suit every shooter. This sight also includes an automatic 1-hour shutoff to prevent battery loss if you forget to turn off the illumination. The specs say it should give you 2,000 hours of use before needing a battery change but that life expectancy will vary based on the brightness level selected. Users like how the illuminated sight is very clearly defined, and since it is not an enclosed optic, the field of view is very generous at any distance and in any light level. It includes a Picatinny rail mount for easy installation right out of the box. It’s also versatile across multiple firearms but sits well on your AR pistol. It’s a good choice for short to medium range shooting. With aesthetics and functionality in mind, the power controls are at the rear of the Strikefire for easy access. The Strikefire II runs off a CR2 battery. Vortex Optics has built a strong reputation for creating quality sights backed by an iron-clad lifetime warranty. The Strikefire II demonstrates another product from Vortex that sets the bar high and aims to deliver. Featuring a red or green illuminated dot, this optic offers multi-coated lenses for a clean, bright, and clear point of view. It also provides unlimited eye relief for maximum comfort and flexibility. Built for ruggedness in mind, the Strikefire II is shockproof and has the industry standard O-ring seal for weatherproof operation. Vortex put some intelligence into the design with simple tweaks like moving all the adjustment controls to the rear for the best functionality. The battery life varies between 300 and 6,000 hours depending on your level of brightness and there are 10 illumination settings to choose from. It’s been called the first and last optic you’ll ever buy since it is built so well and made to last. It has the ability to function well on bright, sunny days, as well as be usable under low-light or coupled with night vision. What MOA level should I look for? – MOA stands for “minute of angle” which accounts for 1/60th of a degree. You’ll see optic sights that advertise 2 MOA, or possibly 4 MOA, etc… The lower the number, the more precise adjustment the optic has for moving the point of impact at 100 yards distance. For example, an optic with an MOA value of 2 will adjust the point of impact 2 inches at 100 yards. In most cases, the lower the better for a tighter group and more precise aim. If you’re only shooting at a very short range, an MOA 4 is acceptable but for longer range, a lower value is needed. Why does battery life vary between brands? – In some cases, it can be simply due to using a smaller battery size to keep the weight low and the profile small. In other cases, it could be that the manufacturer has chosen to emphasize brightness and clarity of the reticle or dot versus extending battery life. Most of it is based on your unique usage and preference, but don’t expect to get anywhere close to the maximum number of hours rated by the manufacturer since that is likely achieved using the lowest brightness setting. The AR pistol has become popular in recent years as laws in some states make it hard to own a full AR-15 rifle. The AR pistol can be fun to shoot and adding an optic to mix will take your accuracy to the next level and improve proficiency. Hopefully, this guide has helped in understanding what to look for in the best optic for the AR pistol. Finding the right one is similar to shopping for a scope, but there are different things to consider. Stick with the well-known brands offering lifetime warranties and you’ll find a great addition to your AR pistol. If you enjoyed reading this article you may also like our articles on sights for the AR-10, red dot and magnifier combo, or scope mounts for the AR-15.